Since inventing the praline more than 100 years ago, Belgium has cultivated a £3.5bn chocolate industry that accounted for 9 per cent of Belgium’s food sales last year. Belgian chocolate, one of the country’s most popular exports, has become the ultimate seal of quality and taste, but for Belgians it runs much deeper. It is a matter of national pride – and the industry is going through an identity crisis. Aside from the general pressures that come with operating in a globalised world where big fish eat the smaller ones, Belgian’s chocolatiers exist in a market where prices are rising, global demand is soaring, and where some of its most established chocolate manufacturers are being accused of muddying the good Belgian name. But Steven Candries, sales director at Guylian, argues that it is possible for companies to have foreign owners and remain true to their Belgian heritage. He insists the Guylian takeover 10 years ago “hasn’t changed anything”, and that it still produces everything in Belgium. In fact, this year it has pledged to become the first Belgian chocolate manufacturer to use no palm oil in its products, which has been linked to environmental, social and health concerns. But some Belgian manufacturers, Candries points out, make their chocolates in factories abroad, and still call it Belgian. For example, Godiva has a factory in Pennsylvania, US. According to Guy Gallet, the secretary general of Choprabisco (the Royal Belgian Association of the Biscuit, Chocolate, Pralines and Confectionary), it’s less important who the manufacturer’s owners are. “What’s most important for us is that the chocolate is made here. Foreign companies don’t invest in Belgian chocolate with the aim of locating it to another county, because they couldn’t then use the Belgian chocolate name,” he says. In some cases, however, these foreign takeovers can affect product lines. Brussels-based chocolate manufacturer Godiva, for example, is almost 100 years old and was bought by American firm Campbell Soup Company in 1966 and subsequently purchased by the Turkish Yıldız Holding in 2007. Last year the company found itself in a PR nightmare when it announced it would no longer be making pralines containing liqueur, which was, up until then, one of its signature chocolates, in order to appeal to more people. Leading Belgian chocolatier Dominique Persoone doesn’t approve. “My grandmother always bought Godiva when I was child. They were very famous for liquor chocolate but now, with their new owners, it’s forbidden. But starting to change original recipes is not a good idea,” he tells The Independent. Annie Young-Scrivner, Godiva’s CEO, says chocolate is part of Belgium’s national identity, and the “essence of what it means to be Belgian”. She says Godiva is a “proud ambassador of the Belgian heritage”, and that the brand is Belgian “through and through”. Despite accusations Godiva isn’t as thoroughly Belgian as some of its competitors, two years later it was honoured with the Belgian royal warrant, and became the official chocolatier of the royal court – a role it still holds today. The company was taken over by Yıldız partly because Godiva was assured they shared a “mutual love and passion for chocolate”, according to the Turkis firm’s chairman Murat Ülker. Young-Scrivner says Godiva has since stayed true to its Belgian heritage, which Yıldız respects, while expanding to more than 100 countries. “We marry innovation with tradition,” she says, offering as an example the chocolatier’s range of products, which celebrate Christmas, Valentine’s Day, Chinese New Year and Ramadan. International takeovers aren’t the only threat to the coveted Belgian chocolate label; manufacturers around the world with no connection to Belgium are using the good name to shift stock, forcing chocolatiers to stand up for what they believe constitutes true Belgian chocolate. The label certainly hasn’t happened overnight. Since Jean Neuhaus Jr, grandson of the founder of chocolate-maker Neuhaus, invented the praline in Belgium in 1912, the country has grown and attracted some of the world’s most talented chocolatiers. It invented the ballotin, a boxed packaging that keeps chocolate fresh, developed methods to transport liquid chocolate, and introduced chocolate modelling paste. “Over 150 years ago, Belgium was an ecosystem of chocolatiers – it was the Silicon Valley of chocolate; taste profiles were refined, and craftsmen innovated and challenged each other and improved their products,” Ignace Van Doorselaere says. European Union legislation says that in order to call a product chocolate, it must contain no more than 5 per cent substitute fat, which is cheaper than using cocoa butter. But Belgium does one better. Belgian chocolate bears little resemblance to the sugary confectionery that goes under the name of chocolate in other parts of the world. The key is the ingredients and the purity of the cocoa, which must conform to strict regulations. Master chocolate-makers never use substitute fats. But manufacturers argue that the quality of Belgian chocolate, and all the hard work behind it, is being undermined by sub-par chocolate claiming to be Belgian – and not enough is being done to get the situation under control. Guy Gallet says EU legislation on misleading labels goes some way to protect Belgian chocolate, but it’s not enough. “We have success with it and there are fewer cases these days where we need to intervene, but it’s harder in, say, China,” he says. Choprabisco is looking at “more proactive” ways of protecting the Belgian chocolate label – one that’s more specific, as the current EU protection applies for all foods. Eating three chocolate bars every month can drastically reduce your risk of experiencing heart failure, scientists have claimed. However, a recent study presented at the European Society of Cardiology conference in Munich states that moderation, not deprivation, is key in preventing heart issues later on in life. However, eating too much chocolate can lead to a 17 per cent increased risk of heart failure, which is why it’s important not to go overboard. Dr Chayakrit Krittanawong, resident at the Icahn School of Medicine at Mount Sinai in New York and lead researcher of the study, explained how the flavonoids found in chocolate can be beneficial for one’s health. European cocoa giant Barry Callebaut CG has released a naturally golden-coloured chocolate in time for the festive season. The gold chocolate has been in development for two years. 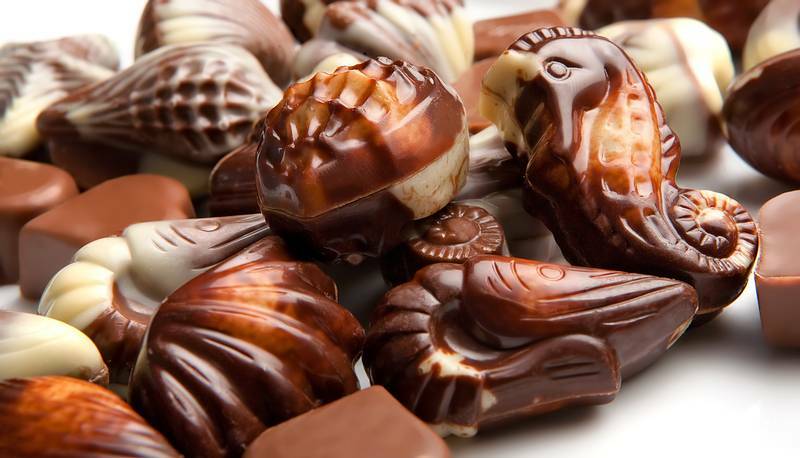 To create the gold colour, Belgian chocolatiers incorporate sugar and milk that has been caramelised into the chocolate. Technically a white chocolate, it contains cocoa butter, sugar, milk powder, milk sugar (lactose), whey powder, caramelised milk powder, caramelised sugar, soya lecithin (emulsifier), natural vanilla and salt. The resulting flavour has "notes of toffee, butter and cream", with an intense toasted caramel and slightly salty taste, and a milky, silk texture. Callebaut's high melting point makes it suitable for cooking and a favourite among professional pastry chefs. We predict the new hue will add a little more glam to your festive banquet, with the use of gold chocolate in classics such as chocolate mousse, fondant, rocky road, fudge, fondue, or a Christmas trifle. For a decade and a half, the big chocolate makers have promised to end child labour in their industry—and have spent tens of millions of dollars in the effort. But as of the latest estimate, 2.1 million West African children still do the dangerous and physically taxing work of harvesting cocoa. What will it take to fix the problem? The boy with the machete is watching us. We’re sitting in an SUV in the middle of a rugged, red-dirt road about 10 miles outside the city of Abengourou, in eastern Ivory Coast. Ibrahim is wearing ripped jeans, a worn, royal-blue Chelsea soccer shirt with the name of the team’s sponsor—Samsung—in large white letters across the front, and the same kind of clear plastic sandals that are everywhere in this part of West Africa. He holds his dusty blade casually against his left hip. For the $100 billion chocolate candy industry, the story of Ibrahim represents a serious problem—one that it has been vowing to fix for 15 years without great success, and which has gained new urgency in recent months. The multinational chocolate makers are heavily dependent on West Africa. More than 70% of the world’s cocoa is grown in the region, and the vast majority of that supply comes from two countries: Ivory Coast and Ghana, which together produce 60% of the global total. The two nations have a combined GDP of around $73 billion, according to the World Bank—or significantly less than Nestlé’s $100 billion in sales last year. Yet the global chocolate business would be thrown into chaos without them. Last year, Ivory Coast alone exported nearly 1.8 million metric tons of cocoa, or two-fifths of the world’s production. And demand for chocolate is going up, as a growing number of consumers in countries like China and India have more disposable income. The price of cocoa surged 13% in 2015 even as prices for most raw materials were dropping. Meanwhile the average farmer in each country still lives well below the international poverty line. Though the most sensational stories about child labour over the years have focused on boys and girls who’ve been held against their will and abused, the more common story is similar to that of Ibrahim. Hundreds of thousands of children are used as free labour by their own families and often asked to take on dangerous tasks like harvesting with machetes or hauling 100-pound bags of beans. For many, school is not an option. There’s been a lot of activity on the corporate side in the last few years. Virtually every name-brand chocolate maker has created or expanded its own sustainability program aimed at tackling the child labor issue by improving the lot of farmers. And through the World Cocoa Foundation, an industry group, 10 of the largest chocolate companies created an ambitious program called CocoaAction in 2014. The plan, which has more than $500 million in funding, aims to reach 300,000 farmers in Ivory Coast and Ghana with training programs to help them boost productivity—under the assumption that healthier economics for farmers will translate to better conditions for their children. Unfortunately, progress has been slow—and by some measures the problem has actually gotten worse in recent years. Last July the Payson Center for International Development at Tulane University released the findings of a comprehensive survey of child labour in Ivory Coast and Ghana in the 2013–14 growing season. Tulane found that 2.1 million children had been engaged in inappropriate forms of child labour in Ivory Coast and Ghana combined—a 21% increase over the 1.75 million identified in its survey five years earlier. Of those, 96% were found to be involved in “hazardous activity.” The number of children reported to be performing dangerous tasks fell by 6% in Ghana but jumped by 46% in Ivory Coast. There was immediate blowback. A batch of headlines proclaimed that child slavery was on the rise. And in September three California consumers, represented by the same law firm, filed class-action lawsuits against Hershey, Mars, and Nestlé, claiming they wouldn’t have bought the products had they known the candy might be tainted by child labour. Read the whole of this detailed and very thoroughly researched article by Brian O’Keefe by clicking on the link below. Mars, the chocolate manufacturer, has pledged to put $1 billion towards cutting greenhouse gas emissions by 67% across its supply chain by 2050. This announcement is the latest corporate backlash against Donald Trump's decision to pull the US out of the 2015 Paris climate accord. “Mars has been in business for four generations and intends to be for the next four generations. The only way that will happen is if we do things differently to ensure that the planet is healthy and all people in our extended supply chains have the opportunity to thrive,” said Mars’ chief executive Grant Reid. As part of its “Sustainability in a Generation” plan, Mars will be making investments in renewable energy, in sustainable food sourcing, cross-industry action groups, and farmers. Mars already powers its operations in the US and the UK with wind farms, but it plans to expand wind power to its operations in 11 countries around the world, including Russia, China, and India. The company, which makes M&M’s, Twix, Milky Way, and Skittles, among others, has also announced an M&M’s campaign centred on renewable energy, that will include featuring images of things like wind turbines alongside the traditional red and yellow M&M characters. With investments in farmers, Mars hopes to help farmers transform the way they grow crops to both be more environmentally-friendly, but also to increase their own incomes. He also said greater efficiencies in the supply chain would help give the company a competitive edge. Mars is taking practical steps to help in the global struggle to achieve the ambitions of the Paris climate agreement, having previously said it was “disappointed” by President Trump’s decision to distance the US from the accord. It was one of the companies that signed a letter in May urging President Donald Trump not to withdraw from the Paris accord. The 2015 Paris accord aims to stop Earth heating up, before the temperature increase since the start of the industrial age reaches 2 degrees celsius. The temperature has already increased over 1 degree celsius, but each nation in the agreement has agreed to curb its greenhouse gas emissions, in an attempt to end the increase. Mars made its sustainability announcement in the lead up to the UN general assembly and climate week, which will run from September 18-24 in New York. They are hoping to spur other companies into action to make similar commitments, but they insist that corporations can’t tackle climate change alone. Muslim countries are turning into fast-growing markets for chocolate, and whilst there is no such thing as halal chocolate, one Asian country is betting more people around the world are going to want a broad range of flavoured chocolate products ...that still comply with the religion’s strict food laws. Malaysia doesn’t grow much cocoa, but it has become the continent’s No. 2 processor by grinding beans imported from neighboring Indonesia, the largest producer outside of Africa and home to the world’s biggest Muslim population. With a majority of its own people classified as Muslim, Malaysia already sells flavoured chocolate products in compliance with Halal principles - which forbid the use of alcohol and some animal products. Islam is the fastest-growing religion on the planet and may have 2.8 billion faithful by 2050, according to the Pew Research Center. Global sales of Halal-certified chocolate confectionery will reach $1.7 billion by 2020, growing at a 5 percent annual rate that exceeds the 4 percent gains expected for all chocolates, according to Euromonitor International Ltd. Malaysia is hoping the growth will help to boost exports that were a record last year. Based on the teachings in the Koran, the certification doesn’t just apply to food ingredients. Processing machines also must avoid alcohol used in cleaning products as well as many animal-based lubricants -- including emulsifiers or gelatins extracted from hogs. Dazzle Food which sells specialty couverture and consumer chocolates, became fully Halal in 2009. In addition to the domestic market, it exports to Singapore, Indonesia, China and the Middle East. The Selangor-based company said the certification helped boost sales by 20 percent to 30 percent over the past three years. Demand may grow even faster this year, it said. Muslim-dominated countries in central Asia and the Middle East provide some of the biggest opportunities for increased exports as their economies expand, according to the Malaysian Cocoa Board. In many, Halal-labeled products aren’t niche markets but mainstream staples. Malaysia doesn’t just sell chocolate. A large part of its exports are cocoa products, fillings and coatings made on Halal-compliant equipment, Norhaini said. Last year, overseas shipments of cocoa beans and products were valued at a record 5.74 billion ringgit ($1.3 billion). Nestle SA stopped Halal-certification of retail chocolate products sold in Australia as of March 2016. Other chocolate brands may comply with Islamic principles but aren’t labeled Halal. That’s not an issue in Malaysia, where all the foods that Nestle sells there, including Kit Kat, are Halal-certified. Malaysia has 51 chocolate manufacturers and confectioneries and 194 local chocolate producers, selling about 1.095 billion ringgit a year, according to cocoa board data. The country is focusing on four regions to boost sales, Norhaini said. The country already has more than 50 percent market share in cocoa powder and butter in Southeast Asia, and 30 percent in the rest of Asia, New Zealand and Australia. In the Middle East it holds a 20 percent market share for cocoa butter and powder imports and in eastern Europe it has a 15 to 17 percent share of chocolate ingredients. Top customers in that region are Russia, Ukraine and Kazakhstan. “By 2020, we should be able to capture 20 percent from the current position for overall eastern Europe," Norhaini said. Choc News : Could mango solve an impending chocolate crisis? Chocolate lovers, your beloved snack may have just been saved by another sweet treat: mangoes. Scientists may have found a way to solve a potential impending shortage of cocoa, which could affect future chocolate production, by using mangoes in lieu of cocoa to make chocolate, according to a study published in Scientific Reports, an open-access journal from the publishers of Nature. "Wild mango is one of the so-called Cinderella species whose real potential is unrealized," says Sayma Akhter, the study's senior author. Global cocoa production has been down in recent years due to a handful of factors, including changes in climate and crop failure, while demand has been on the rise, according to experts. Cocoa producers also have been accused of unfair labor practices, including employing child laborers and underpaying farmers. Wild mango butter, the study says, may be chemically and physically similar enough to cocoa butter to act as a replacement. The study's authors also believe the potential commercial benefits of the fruit could be a boon to conservation efforts. "Going beyond the use to industry, wild fruits like the mango are an important source of food, medicine and income for rural dwellers, but are in decline due to drivers such as deforestation," said Morag McDonald of Bangor University, another of the study's authors. "Adding value to underutilized products through processing for products that have market value can generate a valuable incentive for the conservation of such species and help to generate alternative income sources and reduce household poverty."